Will humans be relevant in the future of cyber security? Advances in automation, machine learning and artificial intelligence affect all areas of expertise – and cyber security is no exception. In cyber security, these advancements have enabled the delegation of time-consuming tasks such as manual threat detection and analysis to machines, freeing up the human workforce to focus on threat forecasting, cyber security strategy and governance. Dr. Nathalie Weiler – CISO at SwissSign – believes that the role humans play in cyber security has fundamentally changed and with the role, the skills required by the workforce have changed as well. “After completing my PhD and post-doc in network security at Zurich’s Swiss Federal Institute of Technology, ETH, I realised that I didn’t want to pursue the classic academic career path of hopping from university to university. More importantly, I was most interested in the practical applications of cyber security. So in parallel to my post-doc, I co-founded a technical consultancy company, where we ran projects in secure IoT activities and building security protocols for multi-media devices. While I was organising a conference for peer-to-peer networking at ETH, I got the opportunity to connect with many people in the industry. An architect from Credit Suisse approached me for a one-time project addressing a network security issue they were facing - I ended up working with that bank for twelve years, immersing myself in so many fulfilling and interesting projects. In the early days, the role of cyber security professionals was mainly to protect IT infrastructure and data. The role was reactive in nature: when a threat appeared or a risk materialised, it was all hands on deck to eliminate it as quickly as possible. Therefore, deep technical knowledge of IT infrastructure was in high demand. Adopting this perception from the start lets you actually come to pragmatic solutions that work. For more than a decade, cyberspace has slowly but surely crept into our daily lives, going from being an experiment spearheaded by few to integrating nearly every one of our devices in our pockets, work devices, household objects and infrastructure management systems. This evolution prompted NATO to add cyber defence to its core task of collective defence. Cyberspace has also been recognised as a domain of operations, with NATO allies recognizing the evolution of threats and seeing the need to be just as effective in cyberspace as in other domains such as air, land and sea. Although the principles underpinning the protection of this space are grounded in the same concepts as traditional domains, Chelsey Slack, Deputy Head of Cyber Defence at NATO, highlights key differences between these domains and what these differences mean in the context of international security. “Growing up in Canada, my favourite subjects were always related to history, social studies and law. During high school, I had my first exposure to international relations; I learned about how countries work together and what they saw as key issues. That really piqued my interest and I decided to pursue my university studies in political science with a focus on international security. Later, I worked for the Canadian foreign ministry and realised that I wanted experience in a multilateral context. After getting my Bachelor’s degree, I landed an internship at NATO, where I worked on trans-national threats. One day during that internship, on my way home for Christmas, I wound up sitting at the airport, waiting for my delayed flight. I starting talking to the person sitting next to me; at the time, I was just about to submit my online application to a Master’s program and this man asked me about my research proposal. When I told him that I wanted to look into post-war reconstruction, this stranger, who worked in a similar field, looked at me very bluntly said: “That’s a very interesting topic but there are a lot of people working on it. I think you should consider focusing on something else. 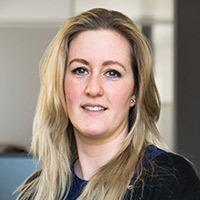 Although the same principle of collective defence – where an attack against one ally is considered as an attack against all allies – underpins cyberspace as it does air, land and sea, Chelsey has developed a deep understanding of how bringing this principle to life in cyberspace is different. The first difference resides in the nature of this space: it is intangible. The second is that cyberspace underpins our communication systems and critical infrastructure, linking it to every other domain, while remaining a distinct domain of operation. The third is the pace of innovation and technological changes in cyberspace and its effect on established procedures. In the past, you could buy a new piece of equipment, for instance a truck or a tank, and it would be good to go for years. Lastly, the number and diversity of actors involved in cyberspace is far greater than on land, in the sea or in the air. Each one of these actors, many of which are private, is a potential target. This makes governments’ role in managing cyber threats and responding to them significantly more complicated. “This decision is context-dependent and ultimately needs to be a political one”. Additionally, if a cyber attack were to be grounds to invoke Article 5, it would not mean the allies’ response would have to leverage cyber capabilities. Many of us do not think about cyber security through the foggy lens of war. Professionals like Chelsey bring cyber security from a commercial concept to one of international security, and ultimately, will have an enormous influence on the world we live in. Dolores Perez, Head of Group Data Protection at KBL European Private Bankers S.A.
Hard work, ambition, and a strong academic background are the recipe for success for Dolores Perez. Unmatched by her predecessors, Dolores held the position of CISO at the international private bank KBL for more than 6 years. Her previous experience in consulting developed her perseverance and ability to make an impact with top management. These two skills have been key to her success. Dolores started her career armed with an engineering and finance diploma from the esteemed Louvain University in Belgium. “From my point of view, a career needs to be built on confidence. Having a good diploma is very important as it already gives you credibility and confidence in what you can do. It shows that you have some grey matter in your head”. She entered the professional world with an adventurous mind looking for new challenges and travels. Dolores first joined a consulting firm and seized the opportunity to work all over Europe in core banking system integration. Then Dolores joined KBL as a supervisor of KBL & Subsidiaries Internal Audit. She evaluated the risks at subsidiaries located in many places including Spain, Germany, England, and Ireland for eight years. This first position at KBL helped her to gain a deep understanding of all the processes within the company. “Being an auditor of the group requires strength and direction. You usually end up in a new country where, as an auditor, you are not always well received, and you need to fight your way in”. After her success in audit, Dolores was promoted to the group’s CISO, and more recently DPO. Dolores’ journey is a good example of how you can flourish in a large international company. Having climbed to the top of the corporate ladder, Dolores takes a step back and explained what she called the “rubber band” effect, an effect one can experience in a career. Dolores then gives her advice on how to react to this effect, i.e. how to pull the rubber band, specifically in cyber security. Dolores has a good metaphor for a career, especially for women in cyber security. Rubber bands are stiff at first just like careers: You need to pull on them to grow and progress. Sometimes, the rubber band will snap back into its original position if pulling too hard, and this can hurt. But eventually, the rubber will stretch and grow if you keep pulling it continuously. For Dolores, pulling the rubber band actually starts very early in life. Dolores believes that it is very important, especially for young girls, to have a role model and not to be subject to any limitations. During education, children must receive encouragement, ambition and self-confidence to tackle the world’s challenges head-on. Even if you are the person pulling your own rubber band career, Dolores recognises that other people can add a little strength in pulling. Networking should be seen as part of your job although it can be challenging at the beginning. “It is something I hadn’t understood in the early start of my career. When networking, I had the impression I was not actually doing my job. I felt guilty. But that’s the wrong vision. Networking is part of your job and usually is a mutually beneficial activity. You learn from others and others learn from you. More than that, working hard 100% of the time is not always the way. Sometimes you need to step back and take time to build your career”. “I was always a high-level person seeing the big picture. Consulting and audit jobs made me go deeper into details, which is a necessary skill for your career. It is easier to master a subject you experienced, not just read about. Consultants also gain experience very quickly as they interact with many different clients. Finally, I was exposed to management and executives very early on in my career, which taught me to synthesise”. With her consulting experience, Dolores was armed with strong skills and deep knowledge to pursue her career at an international private bank. “you should not be afraid to put the tennis ball just at the limit of the court: on the white line”. Having the courage to apply, Dolores got the position of Group Auditor and moved to Spain. Dolores entered into Cyber Security later in her career. She is a good example that it is possible to jump into a moving train like the ever-changing field of Cyber Security. Dolores had to learn about Cyber Security through trainings, certifications and by consulting expert advice. Aided by her scientific background and perseverance, she quickly embraced her new responsibilities. During her time as CISO, Dolores recalls that it was challenging to convey messages regarding security to top management. Dolores was recently promoted to the role of DPO where she will work hand-in-hand with the new CISO. “I’m a natural scientist at heart. My passion for the topic and our planet led me to pursue my education in environmental sciences. With my Master’s degree in hand, I decided to continue in this direction and obtained a PhD in soil physics. As many of my fellow doctors, I was then faced with the question of what to do next: stay in academia or move into industry? Having spent most of my life in school, I decided to make a change and got a job as a strategy consultant. Three years later, I joined Swiss Re as a senior project manager. After fourteen years with Swiss Re, I’m now the Head of Cyber and Digital Solutions. The former US Secretary of Defence, Donald Rumsfeld, famously said: “there are unknown unknowns – the ones we don't know we don't know. And if one looks throughout the history of our country and other free countries, it is the latter category that tend to be the difficult ones.” In cyber security, there seem to be more unknown unknowns than in any other field. And although this may seem like common knowledge today, 20 years ago – when there was no such thing as security departments or even cyber security degrees – this statement may not have been so widely accepted. Karin, former Corporate Information Security Officer at Givaudan, was one of those who was able to appreciate this aspect of cyber security early on and successfully built her career with it in mind. “It all started when I was working as an executive administrative assistant and my boss saw that I was hungry for new challenges. He also saw that I had a particular interest in IT, so he started to give me more tasks in that area and encouraged me to move into a position as IT Support Manager. A few years later, I obtained a diploma in IT project management while working as a consultant for Givaudan. At the beginning of my career in IT as a network and server engineer, security was not at the top of any company’s priority list; the security topic at that time was the chase of some of the first viruses. Over time, security projects started to come in, little by little, with broader scope and higher ambition. Given my experience in project management and IT infrastructure, I was given the responsibility of managing Givaudan’s first global security project, which was to set up a corporate antivirus system. It’s amazing to think that, back then, not having such an antivirus was the norm! After that project and as Givaudan’s needs for security experts grew exponentially, so did my interest and competencies in the field. Having been actively involved in Givaudan’s security team from its very early days, Karin was one of those who was able to appreciate this fact early on and developed a highly effective coping strategy built on three pillars: continuous improvement, knowledge of the business and a strong focus on stakeholders. This is how, over 10 years, Karin raised Givaudan to a firm with a comprehensive and coherent cyber security programme. Being able to secure a business requires a deep knowledge of that business. “You need to get to know the company, from different angles and perspectives”. “The latest technology is not necessarily the best; I always put these considerations in the context of the company, the industry and the people before making an important decision”. “Security is a collaborative effort; it’s not only the IT or security team’s problem. It’s important for everyone to understand that”. In any organisation, it’s not surprising that employees don’t want their daily tasks and creative processes to be disrupted by having to put their passwords in three times. So it’s important to appreciate that and find the right solution to keep the firm safe while maintaining a good employee experience. “Gender equality is important for businesses to attract and retain the best talent. The Executive team and I have committed to increase our senior female leadership to 30% by 2020. In addition to this commitment to increase senior female leadership, Deloitte Switzerland is committed to increase the number of women in technology roles in our organisation by 5% within the next year. The Women Tech Boot Camp is one of our tailored learning and development programmes at Deloitte Switzerland. Hear from participants how they seize the opportunity to upskill for a job in the tech field. Patricia Egger jump-started her career in cyber security armed with a curious mind, an affinity and passion for the subject but without a typical computer science degree. We interviewed her about her journey to cyber, what inspires her about her job at Deloitte and the cyber security profession. "I’m a mathematician who’s passionate about people. My first exposure to security was in a cryptography course I took in high school. Later at university, I loved that crypto had its roots in some pretty complex math, but at the same time, was used by everybody, every day. That’s what keeps me going today: the relationship and dependencies between the science of security and people. What some may not realise is that security is as much of a technical and technological topic as it is a human topic; and I think that’s what makes the field so interesting. After my first year at Deloitte Cyber Risk Services, I can say that I have never felt bored. I have been able to work on interesting and complex client projects, spanning from identity and access management to privileged access management and cyber security risk assessments, which provided valuable learning experiences. In addition, I also have the opportunity to lead the Swiss chapter of Deloitte’s EMEA Women in Cyber initiative and as part of that the Women in Cyber Leadership interview series, that aim at reducing the gender imbalance in the field of security, a cause I care deeply about. Being part of a Women in Cyber team that contributes to changing the perception of the cyber security industry from the ‘hoody-wearing hacker in the dark room’ to a career with exciting opportunities that do not require a computer science background, is incredibly motivating. Supported by both my senior management and my peers, I have been given a platform to make an impact that matters; a privilege that I do not take for granted. " Outside of Deloitte, Patricia also encourages girls and young women to explore the tech and security field by giving personal insights into her experiences and her work at various bootcamps and events. “During my PhD and the first years of my professional career, I gained experience in most areas of computer science, such as databases, operating systems, programming, electronics ands telecommunication networks. I discovered a particular interest for networks and technical network security and quickly realised that technical security would never be enough; vulnerabilities will always remain. This led me to study network management, a field that I found particularly fascinating and still do. That realisation brought me to focus on cyber risk management and I joined the University of Lausanne’s business school as professor. Solange currently sees a paucity of resources and funds dedicated to cyber security on a federal or cantonal level in Switzerland. Solange believes that our authorities and the private sector need to invest in educating all of their citizens in cyber security risks. Instead of seeing cyber security as an issue that only engineers can solve, Solange argues that we need to recognise and value a wider variety of professional experience as well as education. For example, professionals should have the opportunity to complement their existing work experiences with courses to obtain specialised technical, managerial or legal skills. How can organisations begin to bridge this gap? One way is to encourage more women into cyber security; another is to offer them equal opportunity to rise to senior leadership roles. At Deloitte Switzerland, we are committed to addressing this gender imbalance with our EMEA Women in Cyber initiative. As a global Women in Cyber team, we are collaborating to develop and execute various joint activities that promote diversity in the cyber security industry. Watch the space below for regular updates on all activities. At Deloitte Switzerland, we share a common vision with the EMEA Women in Cyber team and work hand-in-hand to promote gender parity in cyber security across all levels from analyst to Vice President. To initiate the dialogue we developed the Women in Cyber Leadership Interview Series. We interviewed female security leaders across industries and academia to create awareness and foster a community that inspires female talent to consider a career in cyber. They spoke with us about their journeys to cyber security, lessons learned and perspectives on their current roles. Whether it is overcoming challenges, advice on how to build a career in cyber or skills needed to succeed, these inspiring stories provide in-depth, diverse and bold insights that will help drive the dialogue in Switzerland and across regions. Read their portraits in the stories & insights section above. Dr Klaus Julisch is the Cyber Lead Partner at Deloitte in Switzerland. Contact Klaus if you would like to know how your organisation can benefit from participating in Deloitte’s Women in Cyber initiative. Patricia is a Senior Consultant at Deloitte’s Cyber Risk Services practice and the Women in Cyber lead in Switzerland. Contact Patricia for more information or if you would like to get involved in Deloitte’s Women in Cyber initiative.